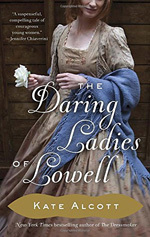 This story is based on the lives, loves and dangers of the females who were recruited to work for the textile corporations of Lowell Massachusetts. These mainly young girls left their farms for opportunities to save money and, hopefully, find new freedoms and expanded cultural lives. The protagonist is Alice Barrow who moves into one of the company dormitoriesw to work on the looms. Finding a soul mate in saucy, daring and somewhat unsavory Lovey Cornell, she is devastated when her friend is found murdered. Was it the female seducing leader of the nearby burgeoning evangelical camp? Or perhaps the younger son of the mill owner? These questions plague Alice and are made worse by her own attraction to the eldest son of the factory owner. A Harvard educated Bostonian vastly above her social status, their potential alliance seems doomed. Explored are the realities of class differences and the ways factories controlled the lives of the girls in order to defend their reputations. The long hours, unsanitary conditions and dangerous work in the mills are vividly told, as is the growing anger by both men and women about their working conditions.